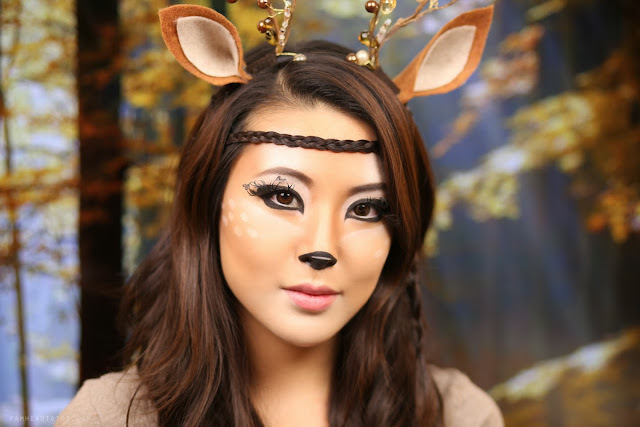 In case you are looking for a DIY costume, here is my interpretation of deer makeup. Check out the video & more pics below. 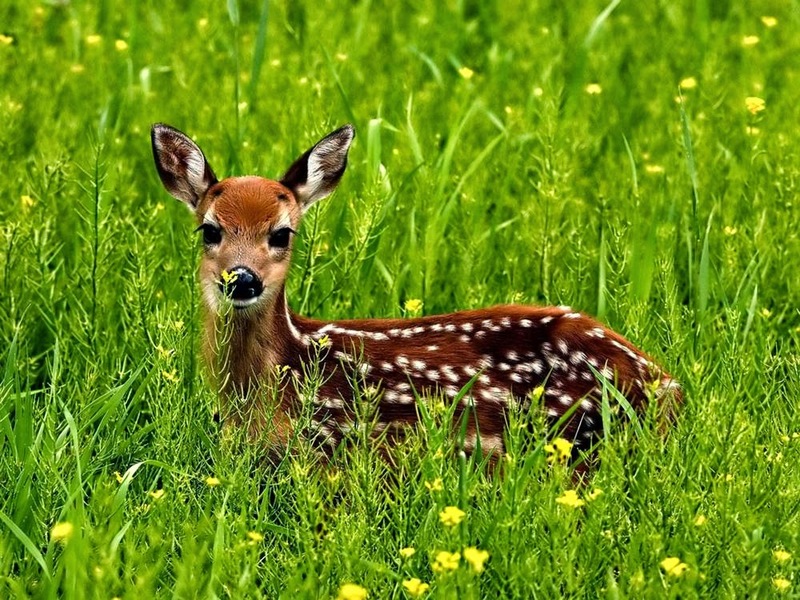 Bambi, can I please have your long lashes? This headband was a DIY project I came up with by combining a decorative garland with a headband using suede ribbon. I then used felt to create the ears. I braided a few strands of hair as well and used it to create a faux headband which seemed appropriately natural-boho for the earthy costume. 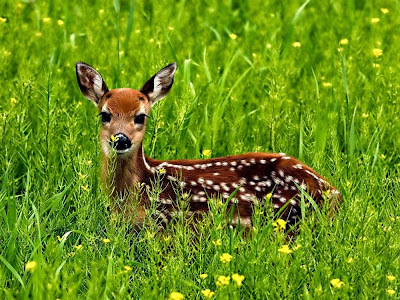 Time to party and have fawn! 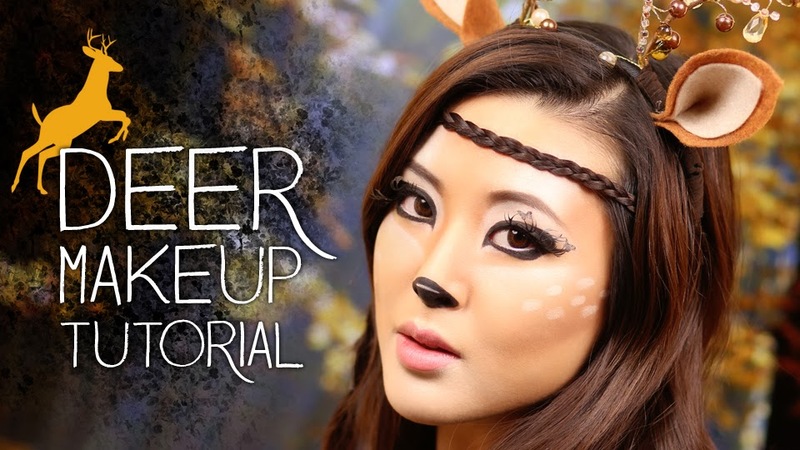 Hope you enjoyed this animal-inspired tutorial. Let me know if you try out this makeup for Halloween and link me any photos you take to my Twitter or Facebook pages. I absolutely love seeing when others test out my tutorials in real life! Readers, have you ever been an animal for Halloween? If so, what animal? What do you plan on going as for Halloween this year? Let me know in the comments! This looks absolutely amazing :) I love it! 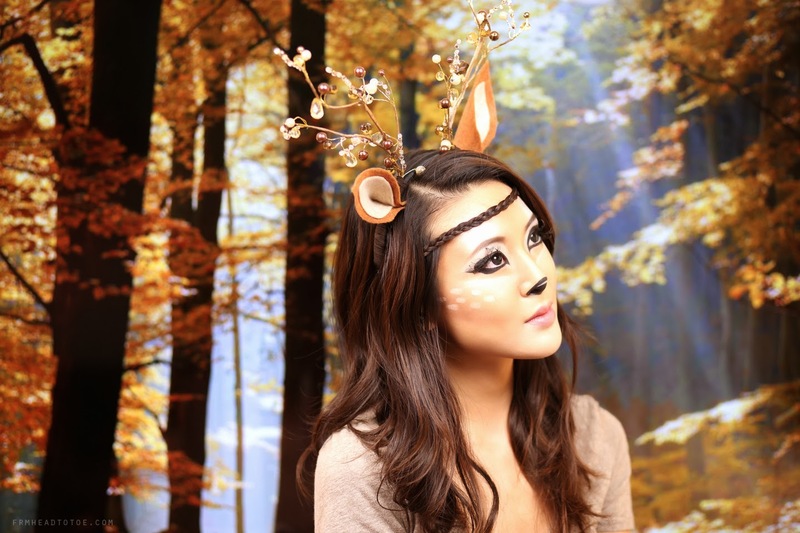 Any chance of a DIY tutorial of the antlers and if you could tell us where you got your matching shirt please? Such a cute Halloween costume! Good work Jen! this is by far the best halloween costume tutorial I have come across so far! I love it :) I was thinking about being a fox this year but you have definitely inspired me to reconsider that decision haha! It's awesome. Really cute look ♥ The headband is also very pretty!! I remember your fox tutorial from last year! Wonderful eyelashes Jen! Love the tutorial! Jen, your videos are all very useful and beautiful. You are very talented in beauty. I have a question about your older post, how can I contact you? Thanks. Jen you're a cute doe. Please let's know the comments you receive during the halloween party. I wish I could join the halloween costume party as a hunter to chase you. Awesome look! I'm gonna be this for Halloween and working on getting the head band together. how did you attach the felt ears and garland to the head band? Maybe I'll do a DIY tutorial on the headband sometime? I used suede lacing and wrapped the garland around the headband, then tied it off and hot glued it down to make sure it was secure. I tried fabric glue as well, but hot glue is just so much quicker and easier to work with in my opinion! I love your headband and would love to see you do a tutorial for it! It's so beautifully made and would love to make one just like it! Please do a tutorial! I absolutely love this! Would you be interested in selling one? I loved the antlers you made. did you make a tutorial? Or where did you get the garland? Love your makeup! 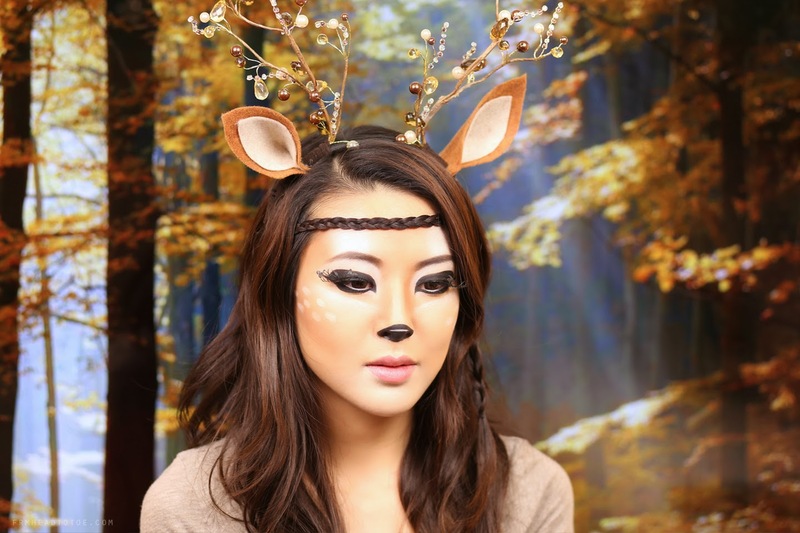 I would love to add it to our deer makeup tutorials here if you don't mind.